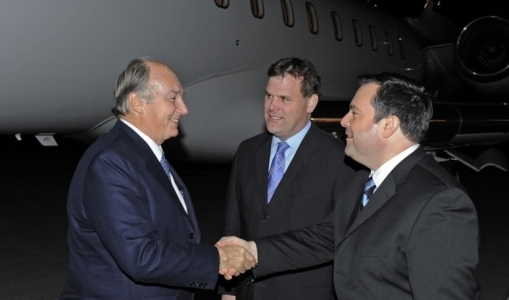 Aga Khan, spiritual leader to Ismaili Muslims, in Canada for eight-day visit - 2008-11-22 | Ismaili.NET - Heritage F.I.E.L.D. He will head west next week, first to Calgary to meet with Alberta Lt.-Gov. Norman Kwong and officials from the University of Alberta, followed by a stop in Vancouver to meet British Columbia Premier Gordon Campbell and Burnaby, B.C., Mayor Derek Corrigan, whose city is home to a sizable Ismaili community. The Aga Khan will also meet and address gatherings of the Ismaili community to discuss the nature of the work he is doing with Canada, how the community has evolved and where he sees it going, said Amir Karim, a Montreal volunteer with the Aga Khan Council for Canada. Born in Switzerland and now residing in France, His Highness Prince Karim Aga Khan became the 49th hereditary Imam of the Shia Imami Ismaili Muslims - generally known as the Ismailis - in 1957 at age 20 following his grandfather's death. Beyond his role as spiritual leader, he is known for his work helping to improve the lives of those in developing nations through the Aga Khan Development Network, which he founded more than 40 years ago. The network has forged a long-standing relationship with Canada, which has seen AKDN, particularly through Aga Khan Foundation Canada, a charitable organization, collaborate with universities, government departments, civil society organizations and the private sector to help developing nations. One such example involves Hamilton's McMaster University, which worked with the Aga Khan University in Karachi, Pakistan, to bring the first international standard school of nursing to that part of the world, said Khalil Shariff, CEO of Aga Khan Foundation Canada. The Aga Khan will preside over the signing of a memorandum of understanding between McMaster and AKU during his visit to Toronto. In October 2006, the Aga Khan and Prime Minister Stephen Harper announced the Imam and Ottawa would each contribute $30 million to a new Global Centre for Pluralism, a think-tank and research facility to be housed in the old Canadian War Museum. 'I think he understands that all the work he does in international development and addressing the great issues of our day as part of the mandate of his office,' Shariff said.